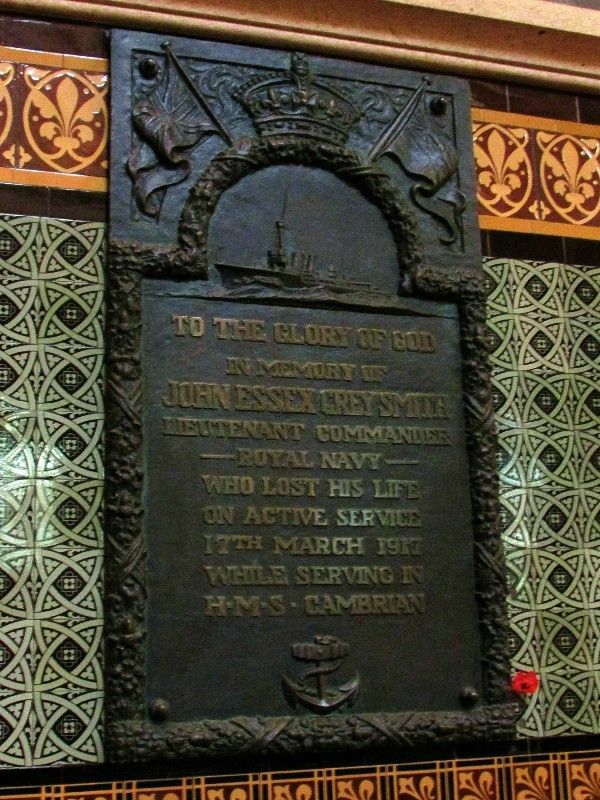 A plaque commemorates Lieutenant Commander John Essex Grey-Smith who lost his life while on active service during World War One. Details have now been received of the death on active service of Lieutenant-Commander John E. Grey-smith, R.N., son of Mr. W. B. Grey-Smith. The Admiralty advise that shortly after midnight on the morning of March 17 he was superintending important work on the forecastle, when a huge wave broke over the cruiser knocking down and partially stunning all those employed. The lieutenant-commander who was in the foremost position and a seamen were washed overboard, the latter being saved by being washed onboard again. All efforts to rescue Lieutenant-Commander Grey-Smith proved fruitless, the probability being that he was stunned, and that death was almost instantaneous. Letters of sympathy have been received from their Majesties the King and Queen, the Lords of the Admiralty and from his fellow-officers with expressions of deep regret at the loss to the navy of a most efficient and zealous officer. The Argus (Melbourne), 26 May 1917.